A Caithness golf club with over 100 years of history is teeing up for the new season by launching a website www.lybstergolfclub.co.uk as part of a drive to encourage new members. Lybster Golf Club (LGC), one of the shortest 9 hole courses in Scotland, is the club of choice of a wide range of golfers of varying age groups and abilities. Their clubhouse is the former ticket office of the Wick – Lybster Light Railway, which was closed in 1944. In recognition of the link to the railway line, the route of which is still visible through the course, the club adopted the steam train, affectionately known locally as the ‘Coffee Pot’, in their distinctive logo. According to Alec Calder, Club Captain, “With the new season almost upon us we are looking at ways of encouraging new members, irrespective of age or gender, to join. We have intentionally kept fees down in an attempt to encourage those who may have been considering ‘having a go’ or getting back to playing to do just that and feel we can offer some of the best value golf in the North. “Thanks to the efforts of our hard working committee and the generosity of our sponsors and benefactors, we have managed to keep our gents fees at only £65 for the year, with a family ticket for mam, dad and the bairns only £80. We may only be a wee club, but we like to make sure there is always a big welcome. One of the ways in which LGC hope to generate additional income is from the sale of International Memberships, which will be available on-line via their website. For the equivalent of £40 per year, anyone whose main residence is outside the UK can take advantage of this offer, which entitles them to get a handicap, unlimited golf, a certificate of membership and an LGC bag-tag. 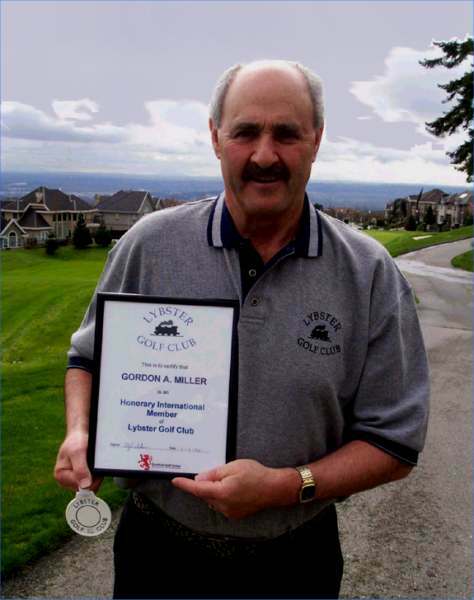 To mark this new venture the club bestowed Honorary International Membership on Gordon Miller, a native of Lybster, who immigrated to Canada in 1953. Gordon, who is a member of the Westwood Plateau Golf & Country Club in Vancouver, sampled what the club had to offer while visiting his family in Lybster last summer. He said, “I am very honoured to have been chosen as an Honorary International Member of Lybster Golf Club and proud to be a Canadian ambassador. I’m looking forward to returning to play a few rounds and enjoy the wonderful hospitality of the members”.